Want an even simpler way to create your submittal required and save time? Now you can import an existing file from your computer to create a new submittal required on BuildingBlok. From the Submittals page within your project, click New Submittal Required and from the dropdown options select Import and proceed to import your CSV/Excel file. 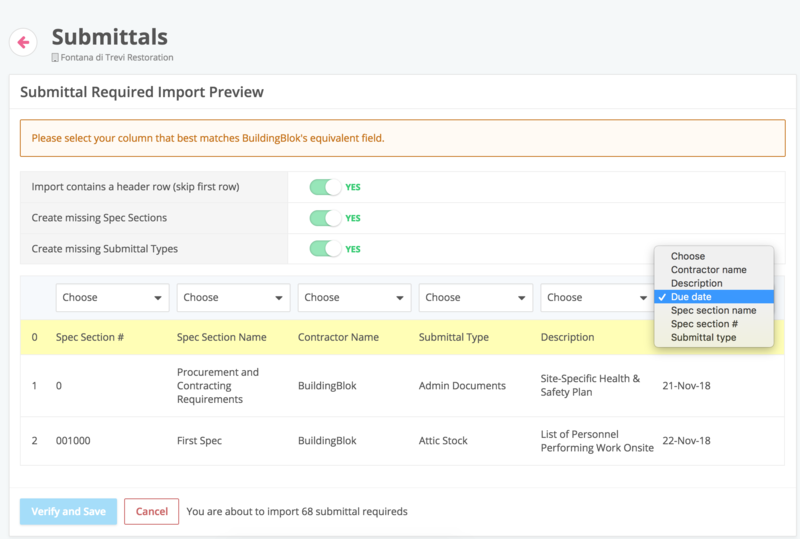 Once you've successfully imported the file, you'll be taken to this screen where you can clarify which columns from your file correlate to the items in BuildingBlok. Once you've selected the appropriate items for each column (note: you cannot repeat options), press Verify and Save and you've made a new submittal required, just like that! As always, we're here if you need any help at all. Happy building!